Artificial Sweeteners Don't Help With Weight Loss : Shots - Health News It's easy to think that artificial sweeteners are a health win. But a review of research finds that there's no evidence they help people lose weight, and they may be associated with other problems. What seems like an obvious choice to lose weight doesn't look so obvious based on available data. The theory behind artificial sweeteners is simple: If you use them instead of sugar, you get the joy of sweet-tasting beverages and foods without the downer of extra calories, potential weight gain and related health issues. In practice, it's not so simple, as a review of the scientific evidence on non-nutritive sweeteners published Monday shows. After looking at two types of scientific research, the authors conclude that there is no solid evidence that sweeteners like aspartame and sucralose help people manage their weight. And observational data suggest that the people who regularly consume these sweeteners are also more likely to develop future health problems, though those studies can't say those problems are caused by the sweeteners. The health effects of artificial sweeteners are important to study, because so many people use them. Another study published earlier this year found that a quarter of U.S. children and 41 percent of adults reported consuming them, most of them once per day. Even more people may be consuming them unwittingly in products such as granola bars or yogurt. "We were really interested in the everyday person who is consuming these products not to lose weight, but because they think it's the healthier choice, for many years on end," says Meghan Azad, lead author of the review and a research scientist at the University of Manitoba. While more research needs to be done, from what we know now, "there is no clear benefit for weight loss, and there's a potential association with increased weight gain, diabetes and other negative cardiovascular outcomes," says Azad. The review, published Monday in the Canadian Medical Association Journal, looked at 37 studies. Seven of them were randomized trials, covering about 1,000 people, and the rest were observational studies that tracked the health and habits of almost 406,000 people over time. Both types of studies have their pluses and limitations. In the seven trials, people were randomly assigned to receive the sweetener or not, allowing researchers to compare the two groups and say with some confidence whether the substance caused a benefit or harm. But because of the cost and effort involved, randomized trials are typically shorter term and don't include as many people. They also may not reflect how people behave in the real world. Observational studies can track far more people for a much longer period, and they better reflect how people actually live. But the links they find between habits and health issues are associations, not direct evidence of cause and effect. Most of the participants in the randomized trials were on a weight-loss program, and taken together, the results showed no significant impact of sweetener use on body mass index. The observational studies actually found a small increase in BMI associated with use of sweeteners, and a 14 percent higher chance of developing Type 2 diabetes for those who consumed the most artificial sweeteners compared to those who consumed the least (though there was a bias toward publishing studies that indicated a link, the authors noted). There was a 32 percent higher chance of cardiovascular events for the heaviest versus lightest users. The Calorie Control Council, a trade group whose members include artificial sweetener manufacturers, notes that randomized trials have not confirmed those associations with diseases. It also says that obesity is complex, with many causes and requiring "personalized, multifactorial and multidisciplinary approaches using a variety of tools." 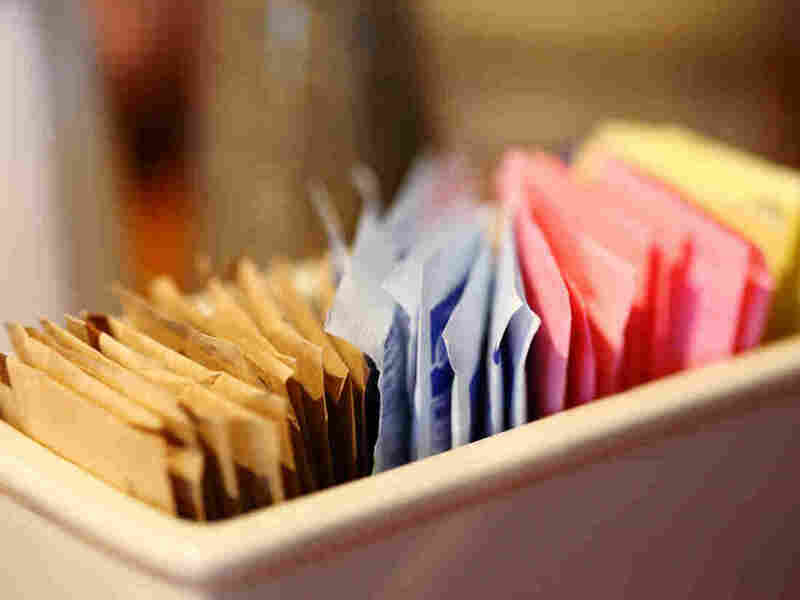 The available evidence suggests that sweeteners may help with weight loss if they are carefully used as a one-to-one replacement for sugar-sweetened drinks or foods as part of a structured weight-loss program, says Allison Sylvetsky Meni, an assistant professor in the department of exercise and nutrition sciences at George Washington University's Milken Institute School of Public Health. But that's not how they're typically used, she says. Sylvetsky Meni wasn't involved in this study, but was an author of the study on the prevalence of sweetener use. There are a bunch of hypotheses for why artificial sweeteners may not promote weight loss or health. They may sharpen a sweet tooth, for example, prompting you to eat more sugary foods, or they may make you feel virtuous but then overcompensate later. Or the sweet taste paired with no calories may confuse the body and change how it handles real sugar, as has been shown in lab animals. 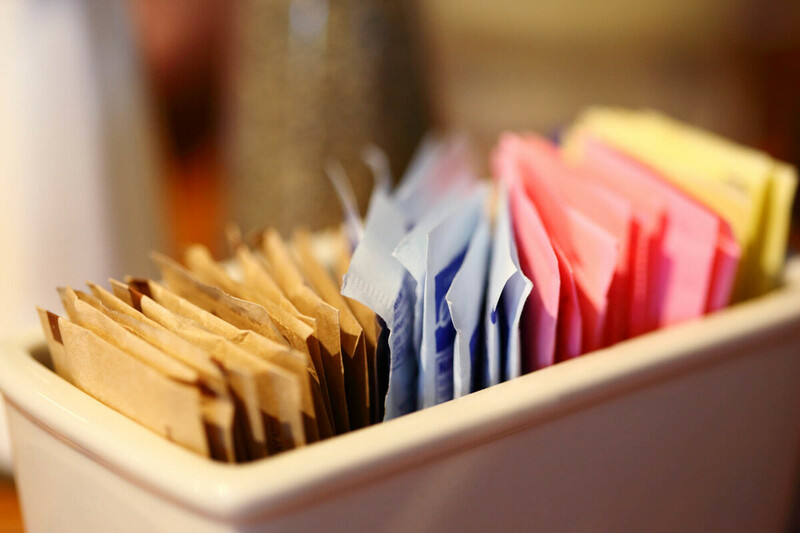 Sweeteners may also alter the microbiome in ways that change metabolism for the worse. Azad and Sylvetsky Meni say that much more research needs to be done, including looking specifically at different sweeteners rather than grouping them together. And more trials that reflect how people consume sweeteners in a host of foods are needed. In the meantime, Azad thinks the lack of proven benefit and questions about harm should give pause to people who choose sweeteners because they think they're healthful substitutes for sugar. Sylvetsky Meni doesn't think having a diet soda here and there is bad. But that's a very different message than outright recommending sweeteners for weight loss or better health, she says. And, she says, one option is to reduce your taste for sweet altogether rather than choosing between a sugar-sweetened or artificially sweetened drink or food. That means getting used to plain or fruit-infused water, black coffee and plain yogurt mixed with fruit rather than products containing either added sugars or artificial sweeteners.